Back home. Took the early flight, 6:25 from Brussels, with a long layover in Munich, arriving to Brno just before noon. Had a nice lunch with Romana. Being a geek, I chose a nice restaurant close to a car park with a fully automated car parking system. I parked the car and spent a few minutes admiring the system, watching my car disappear into the storage system. A light lunch of salmon trout and risotto. I have been reading the book Plannen, periodiseren, trainen, bijsturen en winnen by Jan Olbrecht. 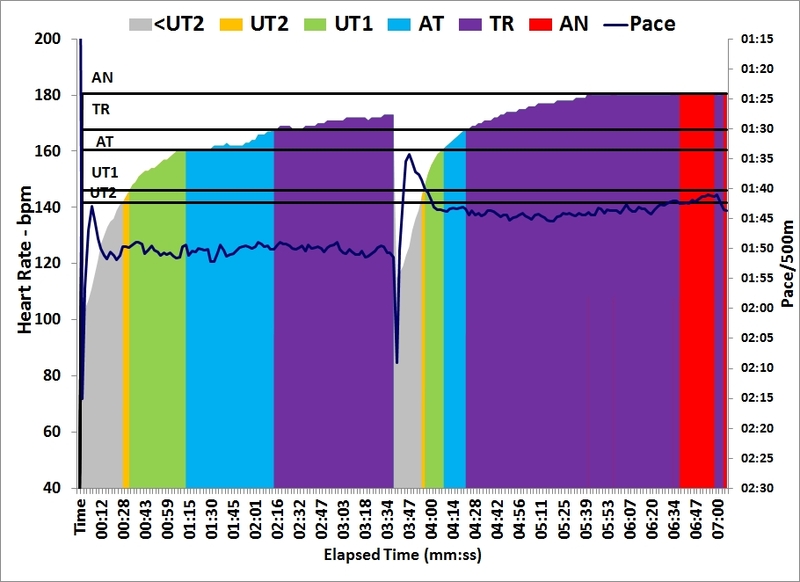 I believe it is the original version of http://www.amazon.com/The-Science-Winning-Periodizing-Optimizing-ebook/dp/B009JTJ676. As always it is interesting to read a text containing a lot of science in my mother tongue. The fate of small languages is that specialized jargon sounds quite artificial. I was fascinated by the approach that he describes and how he builds it on sound scientific principles. I envied him a lot when he described how he, in the 199s, collected lactate statistics and built a computer program analysing the 2x400m swimming test with lactate measurements to predict swimming times of the athlete on various distances. The kind of book that you read from cover to cover, and then start reading it again with a pencil in hand, to deepen your understanding. It definitely motivated me to do the 2-step lactate test that he described. The book is heavily focused on swimming, but looking at the times he quotes for the various distances, I think multiplying the distances by 3 brings it close to my erg times. So on the flight home I was thinking I would do a 2x1200m test. But then I re-read Greg’s blog about the 2-speed test. He uses a 2x1000m format which is well described in his post, and I decided to stick to it. 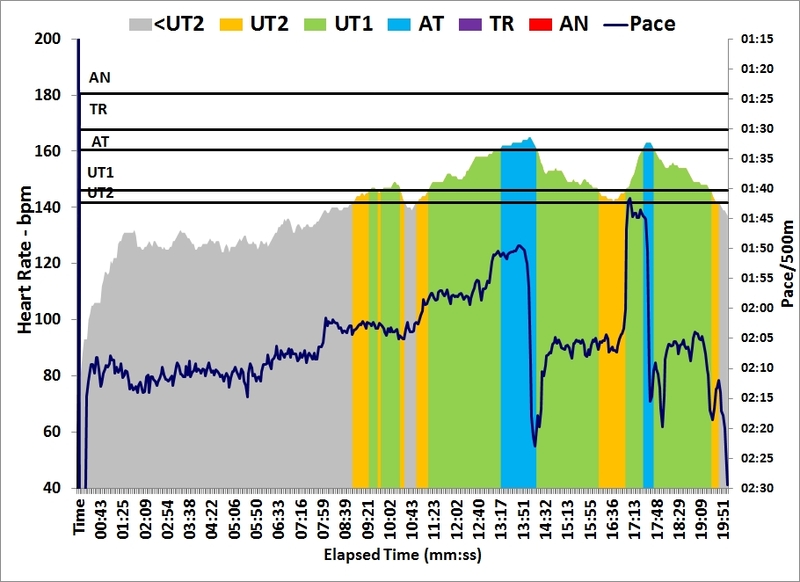 I measured lactate one minute and three minutes after the events. My first measurement after the first 1k failed, so I did it again with the extra strip I had prepared: 3.0 mmol/L. Then I measured again at three minutes after the 1k: 2.7 mmol/L. During the rest of the 15 minute break I paddled slowly. I was a little afraid I would crash on the second 1k, because of the week of business travel. Fortunately, I was able to hold 1:42-1:44 without getting into trouble. I tried to measure at one minute after the row but didn’t get enough blood. A second measurement about 30 seconds late gave me a reading of 4.5 mmol/L. I didn’t have more strips prepared, so I skipped the measurement three minutes after the event. So what does the test tell me? Even though Greg comments that the plot only has meaning when comparing different measurements in time, I believe I can already see what’s going on. The values are quite low. In Olbrecht’s book, the first swim is done around the 4.0 mmol/L level, and the second one above 8.0 mmol/L. I have a theory that I am an aerobic diesel who re-uses lactate (as fuel) quite efficiently, resulting in low values. However, I really need to plan to improve my lactate tolerance at higher speeds and perhaps be able to reach values above 8. The highest lactate value I have ever measured was 4.8 after 10 minutes at 250W (at the end of a 10 minutes step test). Being able to survive rowing at higher lactates should make me faster. 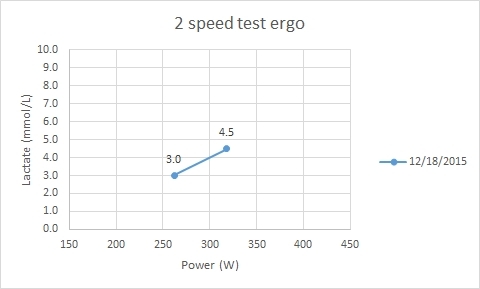 I am also happy that extrapolating the graph to lower power values, I end up somewhere between 1.0 and 2.0 at my steady state training power of 200W. The fact that my data seem internally consistent is a great pleasure to me. I did a 2km cooling down at the end.